S Series and X Series simultaneous sampling devices use simultaneous sampling. M Series, E Series, all other X Series devices use multiplexed sampling. C Series devices in an NI CompactDAQ chassis use both simultaneous and multiplexed sampling, where all devices in the chassis share the same sample clock. Devices, such as the NI 9215, with an ADC for each analog channel use simultaneous sampling. 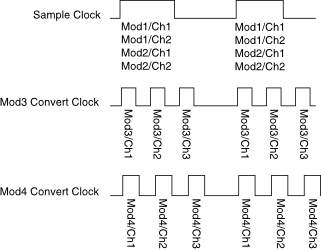 Devices with a single ADC sample in sequence, using multiplexed sampling. An example of such a device is the NI 9205.